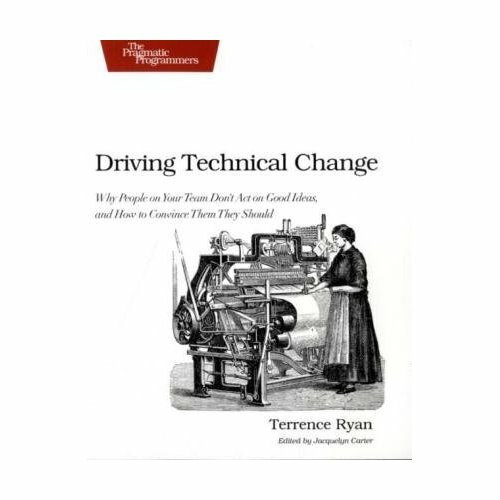 A few nights ago I was over at my local Fry’s looking for a battery charger and a new Compact Flash card for my camera when I stumbled upon the book Driving Technical Change by Terrance Ryan. I think it was the distinctive look of a Pragmatic Bookshelf title that caught my eye. I picked it up, glanced over a few pages, said “what the hell,” and bought it. The book weighs in a bit under 150 pages so it’s a pretty quick read. Even with my slow reading pace and note taking I managed to make it through the book in just a few hours. Driving Technical Change is about learning how to “sell” new tools or techniques to your organization. I really look at it as a marketing guide for developers. The first step is to define what it is we’re trying to sell. Is it a tool? A technique? Regardless, we need to recognize that we’re asking people to make some change to the way they work. Once we’ve identified what we’re trying to sell we need to make sure that it is solving the right problem or if there even is a problem. To do this we need to consider the skills available within the organization and consider alternative approaches. Finally, we can start devising how we want to approach pushing this change into the organization and that is the focus of the book. Note: The author emphasizes that any given person can (and probably will) simultaneously classify as multiple skeptic types. The skeptics are for one reason or another the pockets of resistance you will face when trying to get your organization to adopt your ideas. It’s true that categorizing people in this manner can be dangerous but I don’t really think it’s harmful here. The goal isn’t so much about categorizing people as it is their behaviors. Most of these techniques apply to multiple skeptics and for each technique the book describes some tactics for effectively tailoring your message to the type. I found the book interesting and recommend giving it a read. I enjoyed the author’s style and found the anecdotes not only entertaining but useful for illustrating each point. Although much of the advice seems obvious in retrospect, having it organized in this manner can stimulate some thought. Ultimately though, the underlying themes are to be knowledgeable, be prepared, be respectful, recognize that showing is almost always more effective than telling, and understand that there are some people that you can’t sway no matter what you do. Posted in Practices, Software Development and tagged Book Review, Driving Technical Change on February 4, 2012 by Dave Fancher.